Christmas at our house was wonderful. It was certainly great having family around, although it was sad that not everyone could make it home. I tried to relax and not push myself past the limit of sanity, where I often hang out during the holidays. Brunch consisted of Potato, Sausage and Spinach Breakfast Casserole and a big fruit salad. Lattes and cappuccinos all round as well. This was the first time I tried this recipe and I would rate it an unqualified success. As soon as brunch was over, we finished opening gifts and before you know it, it was time to start dinner. Simmer 2 cups plus 2 tablespoons butter in a large non-stick skillet over medium heat until browned bits form, 6-8 minutes. Pour into a 2-cup measuring cup. If needed, add more butter to measure 1 3/4 cups plus 2 tablespoons (added butter will melt). Whisk flour, sugar, and salt in a medium bowl. Stir in 3/4 cup plus 2 tablespoons brown butter (reserve remaining butter for cake); stir until moist clumps form. Stir in ginger. Set aside. Preheat oven to 325°. Butter pan generously. Whisk all-purpose flour and next 7 ingredients in a medium bowl. Using an electric mixer, beat remaining 1 cup browned butter and sugar in a large bowl until light and thick, 2-3 minutes. Add eggs one at a time, beating to blend between additions. Beat in sour cream, milk, and vanilla. Stir in flour mixture just to blend. Spoon half of cake batter into prepared pan; smooth top. Scatter 1 cup of topping over. Spoon remaining batter in dollops over; smooth. Add almonds to remaining topping; squeeze to form 1/2″ clumps and scatter evenly over batter in pan. 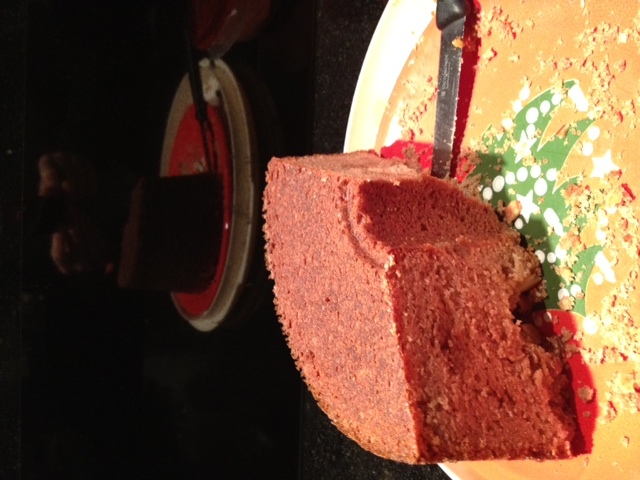 Bake until a tester inserted into center of cake comes out clean, about 1 hour 20 minutes. Let cool in pan on a wire rack for 10 minutes. Run a knife around edge of pan to release cake. Remove pan sides; let cool completely. DO AHEAD: Can be made 1 day ahead. Store airtight at room temperature.